For anyone who has any level of interest in military aviation, RAF Fairford is the place to be in July for the Royal International Air Tattoo. In its various guises since the first Embassy Air Tattoos held at North Weald, the show has gained an unmatched reputation for showcasing military aviation from around the world. 2015 continued that fine tradition with the country of Qatar making its Air Tattoo début and the first flying display in Europe by an aircraft from the Japanese military. 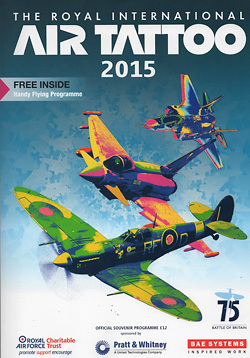 Over the forty years of the Air Tattoo, there have been many changes. From its relatively simple beginnings the Tattoo has grown to a very important event for the aerospace industry and defence diplomacy. Recent years have seen many challenges for the organisers with defence budgets around the world reducing, much more emphasis on the security of the event and stronger regulation of the event from such organisations as the Military Aviation Authority. 2015 also saw a significant change at the head of the event organisation with Andy Armstrong taking over the reins of the event from Tim Prince for the first time. From an aviation side, RIAT 2015 was an incredible success, but just as important to large event such as RIAT is the “visitor experience.” RIAT go to great lengths throughout the show to make the RIAT experience a positive one. Certainly the introduction of the large “Service Stations” and the incredibly friendly and helpful “Air Tattoo CREW” have gone down very well and certainly made the still vast showground a much more welcoming place. However, this year more than ever there were some noticeable niggles creeping in. For FRIAT Mach 3 Members who commit to a fairly pricey package “to see all the action” the closure of the members enclosure a 5pm on the Thursday just as the arrivals for the show were about to get really busy was a bitter pill to swallow. One of the reasons for this is the regulation of military flying displays which requires many of the international military acts to be “validated” over a sterile airfield ahead of their public appearances. While these validation flights don’t have to take place at the Tattoo, it would be impossible be the Air Tattoo team to validate every display away from Fairford. Therefore, the show has to build in periods for the validations to take place and therefore the event must comply with the regulations. Visitors to Yeovilton’s “Arrivals Photocall” also found this out having to leave the airfield at 3pm. It is an unfortunate situation for the FRIAT organisers and I don’t know what the solution is as I doubt the regulations will change nor would it possible to orchestrate arrivals to such a level. Perhaps some more prominent information for the FRIAT members and some new ideas to compensate are required. The addition of the Friday events is part of the build up to 2018 when the show celebrates 100 years of the RAF with three full public days. 2015 saw another “Air Tattoo Lite” style event with 2/3rds of the showground open and a shortened flying display. It was far from smooth running however with difficulties at the entrance gate delaying gates opening by up-to 30 minutes over the published time. Once in, it just didn’t really feel at the Air Tattoo we all know and love either – there’s something that just hasn’t clicked with the Friday. Finally, it did seem that the public were been hurried off the airfield almost as soon as the flying had finished, particularly on the Saturday. With so much traffic to clear, many shows ask the crowds to stagger their departure and it wasn’t so long ago that RIAT held evening concerts in an effort to do just that. While there was a good hour before the showground closed, it did seem a bit more unwelcoming for those still looking around the still vast showground. Perhaps RIAT should look at the likes of Dunsfold which now run some small scale entertainment well into the evening! When it comes to Securing the Skies and ensuring the safety of its citizens, the UK has always relied predominantly on the skill and professionalism of the men and women who serve in the Royal Air Force. Whether countering increasingly sophisticated and diverse military threats or delivering humanitarian assistance and disaster relief, Securing the Skies and demonstrating Air Power is critical at home and around the globe. Today, thanks to cutting-edge platforms operated by highly skilled personnel, the RAF is capable of controlling airspace, providing timely and accurate intelligence and mobilising quickly and effectively to meet a wide range of missions. The same is true of those air arms operating alongside the RAF, and in 2015 the Royal International Air Tattoo invited them to RAF Fairford to help highlight how Securing the Skies is achieved across the world. That’s enough negativity however as the central aviation element was truly spectacular and memorable with an outstanding international participation on the ground and in the air. While the static park is certainly smaller than the glory days of the mid 1990’s, it still attracts some real gems. At the centre of the static park were some true stars including the pair of Spanish Air Force Northrop SF-5M Freedom Fighters parked alongside a pair of USAF Fairchild A-10C Thunderbolt IIs which in turn were parked next to a Sukhoi Su-22UM Fitter-K from the Polish Air Force. Notably the A-10s were just part of a much larger USAF participation than in 2014. There was a welcome return for the KC-135R Stratotanker from the 100ARW at RAF Mildenhall and F-15C and F-15D Eagles from the 48th Fighter Wing at RAF Lakenheath. The Special Operation Command missions at Mildenhall were also represented a pair of Air Tattoo débutantes in the form of the Lockheed Martin MC-130J Commando II and the Bell/Boeing CV-22B Osprey. As well as the Air Force, the United States Army also made a welcome and very rare contribution to the RIAT static display with a Boeing AH-64D Apache and Sikorsky UH-60A Blackhawk in MEDEVAC configuration. It was great to see the C-130 Hercules in abundance once again. The Qatari Emiri Air Force made their Air Tattoo début with one of their relatively new C-130J Hercules II which was parked opposing the familiar C-130H Hercules from the Royal Jordanian Air Force. Other familiar Hercules operators included the Royal Netherlands and Belgian Air Forces with examples of their C-130Hs. As always the Netherlands made a significant contribution with one of the CH-47F Chinooks making its Air Tattoo début, AH-64D Apache, a Coastguard Dornier Do228NG and the giant McDonnell Douglas KDC-10 Tanker. The German Navy too has their own Pollution Control Do228 on show as well as a Sea Lynx Mk88 and a EC135P+ training helicopter. Other notable helicopters included a very smart Mil Mi-14 Haze from the Polish Navy and a Czech Air Force Mi-35 Hind-D wearing RAF Coastal Command colours. Maritime Patrol Aircraft are a hot topic within the UK at the moment with a likely purchase of aircraft touted for the next Defence Review and they formed a central part of the static display. While the German Navy, Royal Danish Air Force and Irish Air Corps had their current platforms on show in the form of the Lockheed P-3C Orion, Bombardier CL601 Challenger and Airbus Military CN295MP the focus was very much on the future. Boeing returned with the P-8A Poseidon from the US Navy’s VX-1 Squadron. The unit already has UK personnel embedded within it as part of the Seedcorn project and the P-8 is seen as the front runner. Boeing also had its MSA Demonstrator at the show. Based on the Bombardier Challenger, the MSA incorporates a lot of technology from the P-8 in a smaller airframe but without the ability to deploy weapons. However, the star was the Japanese Maritime Self Defence Force Kawasaki P-1 from squadron VX-51, one of a pair attending RIAT. Other notable international and civilian participants in the static included the Slovenian Air Force PC-9M Swift, the Belgian based Bronco Demo Team with a significant display of OV-10B Bronco and two Shorts SC7 Skyvans, Stephen Stead’s Supermarine Spitfire XVI, Tracey Curtis-Taylor’s Boeing Stearman and a collection of Airbus Military CN295s from the Spanish, Polish and Finnish Air Forces. One of the more imaginative themes of RIAT 2015 was the 35th Anniversary of the Tri-National Tornado Training Establishment. A unique multi-national unit, the TTTE was based at RAF Cottesmore in Rutland and provided basic flying training on the Tornado from 1981 through to 1999. The static element of the theme was three Tornados from the current Royal Air Force, Luftwaffe and Italian Air Forces lined-up wearing a special tail decals specially applied at RIAT to mark the anniversary. The UK Armed Forces as always were well represented. The Royal Navy had examples of the Sea King HC4, Merlin HM2 and their “new” Merlin HC3 on static display. Close by were the Army Air Corps with examples of the WAH-64D Apache AH1 and Gazelle AH1, the latter parked with the Gazelle Squadron. The Royal Air Force were much more spread out with aircraft covering a number of themes and areas around the static display. One of the more poignant contributions was that by the Westland Sea King HAR3As from the Search and Rescue Force. 2015 is their final RIAT before retirement and they have long been a feature of Air Tattoos in the flying and static displays as well as an important support role in the case of incidents. Other helicopters included an Airbus Helicopters Puma HC2 from RAF Benson plus the Squirrel HT1 and Griffin HT1 pair from RAF Shawbury. RAF Training like much of the Air Force is going through some major changes with the Military Flying Training System (UK MFTS) coming into full effect. Examples of the Grob Tutor T1, Shorts Tucano T1 BAE Systems Hawk T2 and Beechcraft King Air B200GT were all on static display. Particular mention should go to the pair of Hawk T1s from 208[R] Squadron, one of which was wearing its centenary markings commemorating their First World War heritage. The future of UK MFTS was also on show with the successful bidder Affinity Flight Training showing off the Grob 120TP and Embraer Phenom 100 which will replace the Tutors and King Airs at RAFC Cranwell in the not-too distant future. Hawker Beechcraft also had the AT-6C Wolverine on display which is armed version of the T-6C Texan which is due to replace the Tucano under Affinity’s plans. Royal Air Force aircraft also supported the industry displays with a 31 Squadron Tornado GR4 and 11 Squadron Typhoon FGR4 on displays in the BAE Systems exhibition alongside Classic Air Force’s Gloster Meteor T7, the Historic Aircraft Collection’s Spitfire Vb and Hurricane XII and Brooklands Museum’s Sopwith Camel replica. The RAF marked the operational theme of the Air Tattoo with a combination of Boeing E-3D Sentry AEW1 and Eurofighter Typhoon FGR4s from Nos 1[F] and 6[F] Squadrons based at RAF Lossiemouth. Air Mobility from nearby RAF Brize Norton was well represented with a Lockheed Martin C-130J Hercules C5 and the latest Airbus A300MRTT Voyager KC2 to join the AirTanker fleet. The RAF Village, one of the centrepieces of the ground show saw the Airbus A400M Atlas C1 make its public display début at the show and it was open for tours throughout the weekend and also won the “Concours d’elegance” Trophy for the best presented aircraft on static display. The flying displays more than matched the variety on the ground. While Friday saw a shortened four hour flying display, Saturday and Sunday saw the traditional eight-hour epic starting at 10am in the morning and ending at 6pm. Apart from the early part of Friday’s display, the weather was fair throughout the flying display periods so the full display went ahead as planned. Opening the main weekend flying displays were the Spanish Air Force national aerobatic team, Patrulla Aguila. The team, who fly seven CASA C.101 Aviojet trainers, were completing a mini-UK tour having displayed at the Yeovilton Air Day a week earlier. Up until Yeovilton, the team had not appeared in the UK since 2011 when they were last at RIAT. That year, weather during their display slots prevented them from getting off the ground so it was good see much kinder conditions this time around! Patrulla Aguila were just one of the usual excellent array of national display teams that mark the Air Tattoo flying display out from other big UK shows. The Royal Jordanian Falcons once again returned with a full four-ship routine to continue their long association with the show. The Swiss Air Force put in an excellent contribution to the show with their PC-7 Team and Super Puma performing together. The opened with the eye-catching formation of the PC-7s leading the Super Puma that was seen at Payerne and Kliene Brogel last year to celebrate the 100th Anniversary of the air arm. They then split leaving the Super Puma to perform its excellent solo routine. As the Puma closed his display the PC-7 Team ran in right behind him giving spectators at crowd centre a very engaging photo-opportunity. The honour of closing each day’s flying displays went to the French Air Force’s La Patrouille de France. With eight Dassault-Breguet Alpha Jets, the team are one of the very best in the world and certainly provide a very elegant and well placed routine with great use of smoke to highlight the team’s manoeuvres. Joining it’s compatriot on static display was a further Kawasaki P-1 participating in the flying displays. It was a truly historic moment for the Air Tattoo organisers as it marked the first time a Japanese military aircraft has participated in a European air display. The Japanese Maritime Self Defence Force has received just 10 P-1s and they are still very much in the operation evaluation stage and the visit to Fairford was just part of a much bigger deployment. Following their appearance at the Tattoo, the two P-1s went on to Djibouti to join the Japanese anti-piracy deployment. In the display, the crew from VX-51 demonstrated the type’s impressive performance. The aircraft is incredibly quiet at slow and high speed which a clear benefit for the surveillance role. The aircraft gave two flypasts, one showing off the aircraft weapons bay under the forward fuselage before landing on. The appearance at Fairford was not only a chance to put the P-1 on the radar of the many European nations starting to look at modernising their maritime patrol aircraft, but also to foster better relations between the Japanese military and its European allies. The United States Air Force made a very welcome return to the Air Tattoo flying displays with a further example of the CV-22B Osprey operating direct from RAF Mildenhall. It was more of a role demonstration than a flying display highlighting the contrast in the high speed performance and hovering abilities of this Special Forces variant of the military tilt-rotor aircraft. More traditional rotorcraft featured well in the display. The Royal Air Force sent the tremendous Chinook HC4 display team to support a Joint Helicopter Command showcase which also included the Attack Helicopter Display Team with their pair of Apache AH1s supported by very impressive pyrotechnics. The only Royal Netherlands Air Force contribution was another AH-64D Apache, though this time a very aerobatic display rather than a role demo. It was great to see a Mil Mi-35 (24V) Hind-D back in the flying display thanks to the Czech Air Force. The “Hind” is a very imposing aircraft with bags of presence thanks to its insect-like look and impressive size. Unlike many helicopter displays, it really can cover the ground quickly displaying to the whole crowd with orange smoke-flares trailing from the stub wings. Punctuated the display were three big set-piece displays. The first of which was the airborne element of the TTTE 35th Anniversary celebration. This involved Panavia Tornado aircraft from the RAF, Luftwaffe and Italian Air Forces flying together in a very rare formation which made three passes along the crowdline. Each pass demonstrated the Tornado in a different wing sweep configuration before the trio broke into the circuit and landed. While it may not have been the most dynamic of the displays, it was certainly an increasingly rare chance to see the Tornado, particular from Germany and Italy, in the air at a UK airshow. The second formation consisted of four Hurricanes, including both Hurricane IIcs from the BBMF, The Biggin Hill Heritage Hangar’s Hurricane I and Peter Teichman’s Hurricane IIb. Bpring up the rear of the formation were two sections consisting of the BBMF’s Spitfire Vb AB910, Spitfire IX MK356, Spitfire XVI TE331, OFMC’s Spitfire IX MH434, BHHH’s Spitfire IX TA805, Rolls Royce’s Spitfire PR XIX, Kennet Aviation’s Seafire XVII, Richard Lake’s Spitfire XVIII and ARCo’s Hispano HA-1113-M1L Buchon. Upon the Vulcan landing on after the flypast, the Reds Arrows went on to give their usual polished performances in great weather. For many though, the Royal International Air Tattoo flying display is all about fast jets. With the Battle of Britain commemorations, it was good to see great support for the event by the Czech and Polish Air Forces. The former sent its hard-working Aero Vodochody L-159A ALCA solo for a typical noisy routine. However, one of the real stars of the show was Polish Mikoyan MiG-29 Fulcrum. Belching huge clouds of black smoke, the MiG-29’s take off was quite incredible as it simply raised its wheels at flying speed racing at low level along Fairford’s runway before pulling into the vertical to start a typical punchy display. The Paul Bowen Trophy, presented in memory of the Royal International Air Tattoo co-founder Paul Bowen for the Best Solo Jet Demonstration, went to the Finnish F-18C Hornet flown by Capt Ville Uggeldahl. The Hornet is an interesting display aircraft; powerful and noisy it has an almost unique agility being able to fly at very extreme angles of attack and performing near square turns while Ville took full advantage of during his sequence. Strangely absent from the static park were any example of the Lockheed Martin F-16 Fighting Falcon. That was put right in the flying display with two different displays. The Belgian Air Force presented their F-16AM Fighting Falcon solo which wears the new “Blizzard” display scheme is flown by Captain Tom “Gizmo” De Moortel. Tom’s display is everything we come to expect from a European F-16 display with smoke-winders on the wingtips and a flowing mix of slow and high speed figures. Finally, making a very long overdue first appearance at RIAT were the French Air Force’s Dassault Mirage 2000N tactical demonstration team “Ramex Delta.” The team present a pair of the nuclear strike variant of the famous French fighter demonstrating some very tight formation flying as well as many of their tactical manoeuvres they employ on missions. They have been very popular at European shows and have been on RIAT wishlists for years. Their display on Saturday did not disappoint though sadly Sunday saw one aircraft suffer a technical issue soon after take-off reducing the display to a solo. They were incredibly unlucky not to be included in the RIAT awards. While there were certainly a few niggles with the visitor experience this year, the superb aviation element almost completely eclipsed them. No other airshow, certainly in the UK beings together such an incredible array of aircraft. The by-line for RIAT for many years has been “The World’s Greatest Military Airshow” and going by what the team at Douglas Bader House achieved this year, the show more that lived up to the expectations of that statement.